Venture into southeast DC and discover Anacostia, a vibrant neighborhood with museums, bike paths and a rich African American history. One of neighborhood’s most famous draws is Cedar Hill, the home of Frederick Douglass and now an historic site run by the National Park Service. Guided tours are your only way inside the home, which includes artifacts that belonged to the former slave-turned-nationally renowned abolitionist. In addition to Douglass' home, some 500 other buildings comprise the Anacostia Historic District, featuring unique two-story cottages, Italianate-style architecture and Queen Anne-style homes. About a mile away from Cedar Hill you’ll find the Smithsonian Institution’s Anacostia Community Museum, which is committed to the study of challenges facing contemporary urban communities. Exhibits highlight life as a local for many black residents, as well as immigrants like the permanent Bridging the Americas exhibit, highlighting Zonians and Panamanians. The newest, most lavish addition to the neighborhood is the Entertainment Sports Arena, which serves as the home venue for the Washington Mystics and the Capital City Go-Go, as well as the practice facility for the Washington Wizards. The state-of-the-art arena also hosts concerts – check their events calendar to see what else is in store. Once known as Uniontown, Anacostia was one of Washington, DC’s earliest suburbs. Many employees of the Navy Yard, located just across the 11th Street Bridge in today’s Capitol Riverfront neighborhood, bought homes in the area during this time. For as well documented as its history is, Anacostia also provides a serene natural retreat for walkers, hikers and bikers. 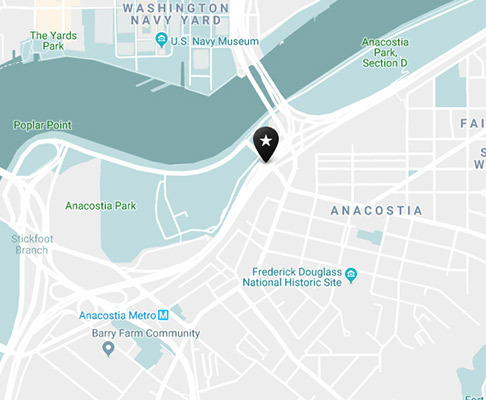 Hop on the Anacostia Riverwalk Trail (it connects the east and west sides of the river at the 11th Street Bridge and South Capitol Bridge) and explore it from Poplar Point, part of National Capital Parks-East, northeast to the nearby Kenilworth Park & Aquatic Gardens. Volunteers looking to contribute and positively impact the local ecosystem can link up with the Anacostia Watershed Society. Take the Metro to the Anacostia station on the Green Line or hop on the Circulator route, Potomac Avenue Metro–Skyland via Barracks Row. By car, get there via the 11th Street Bridge, which served as John Wilkes Booth's escape route on the night of the Lincoln assassination. Dive in to the tradition of the Anacostia neighborhood. As one of DC’s oldest neighborhoods, there’s still something new to discover at every turn. From the Big Chair to the quaint cottages, learn more about what it’s like in Anacostia.